The Toshiba Satellite L55-A5184 is an L50 series slim and smart looking professional 15.6 inch notebook with a few useful features and offers a nice blend of speed, flexibility and design. It is suitable for home entertainment, school or office use as it is capable of smoothly running several programs simultaneously and letting you play songs, games and videos. You'll see the price is low too for all that it is offering. Toshiba L55-A5184 has a 4th generation Intel Core i5-4200U processor at 1.8GHz speed, 8GB of SO-DIMM DDR3 RAM at 1600MHz, 750GB SATA 5400 rpm hard drive and the latest Windows 8.1 OS.. Haswell- 4th generation processors have the advantage of energy efficiency over the 3rd generation Ivy Bridge processors while still offering power and speed. 8GB RAM is more than anyone would need for multitasking of many programs and keeping several tabs open without experiencing freezing, but is expandable to 16GB maximum for even better multitasking performance. Hard drive has the right size for a laptop at this price level although it could be a 7200rpm one, but not a big deal. You won't need to upgrade to Win 8.1 from Win 8 as often the case as it already comes pre-installed. 15.6 inch Truebrite LED backlit widescreen (16:9 cinematic aspect ratio) diagonal display with 1366 x 768 pixel resolution and Mobile Intel HD Graphics with up to 1792 MB shared graphics memory.. LED backlit means the screen will use less energy and last for a long time. It supports 720p content and the image quality is more than satisfactory. You'll also find the DTS Sound system like other Toshiba Satellites, along with the integrated stereo speakers it offers immersive sound that is loud and clear. The built-in HD webcam with microphone will allow you to do live chat or videoconference with people. Resolution+ helps transform the regular DVD content to much clearer high definition picture. Mercury Silver in Fusion Horizon Toshiba Satellite weighs 5.35 pounds with measurements of 14.87 x 9.6 x 1.13 inches. 4-cell lithium ion battery is reported to be more than 6 hours in normal usage in single charge. Premium full-size US keyboard with numeric 10-key pad and gaming commands offers accurate typing and easy data entry. And the touchpad underneath supports multiple touch gestures- swipe, zoom, pinch, scroll or rotate. This is an Energy Star qualified machine like 93% of Toshiba notebooks and EPEAT Gold registered for being good to the environment. 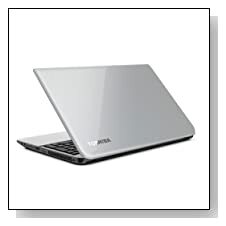 It comes with a DVD-SuperMulti drive supporting 11 formats despite being a relatively slim model. The HDMI port helps you hook up to your HDTV and work or play on a larger screen in HD quality. You have the 802.11bgn for wireless internet access and 10/100/1000 Gigabit Ethernet LAN with RJ-45 for wired access. Bluetooth 4.0 is for synchronizing with your smart phone or linking wirelessly to Bluetooth enabled devices. 2 x USB 3.0 ports (one of which is a Sleep and Charge), 1 x USB 2.0 port, Memory Card Reader, Headphone jack (stereo), Microphone jack (mono), an HDMI port and RGB port but it has no SmartCard Reader slot. 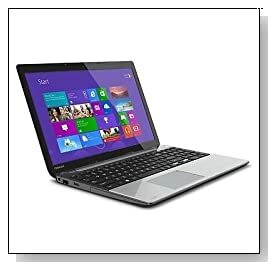 Conclusion: Toshiba Satellite L55-A5184 is a powerful good value computer that is packed with handy features you would use on a daily basis. It has a glare-free display, DTS sound and stereo speakers, DVD player, USB 3.0 ports, Bluetooth, 750GB hard drive, 8GB RAM and a powerful Haswell i5 processor. It is suitable for multimedia editing but not so much the most demanding 3D games at high settings. Windows 8 OS is still not the favorite of many customers but the latest Win 8.1 comes with additional functions that could make their life easier. It looks good, feels durable and reliable- being also a Toshiba computer and performs well at different tasks. Highly recommended as it seems to present overall great value for home entertainment or work purposes.